Since I can’t leave well enough alone with this, I’m following up Calendaring: Still not there… with a post about events. I blame Aaron for this. Sure, I could talk about Darwin Calendar Server, mention Calendar Swamp, or complain about http and WebDAV and CalDav and webcal in relation to calendars (I guess they are all somehow different…) But why bother? Aaron posted about upcalendar and he even released code. Now, I’ve known Aaron for a long time, and I still read many of his posts and then re-read them, and then scratch my head and say “Huh?” As for his code, I try not to look at it. Anyway, from what I can decipher, upcalendar is about taking your events from Upcoming.org with you, so that’s what I wanted to attempt. First I went to Upcoming.org and under ‘My Upcoming Events’ choose ‘Subscribe’ and picked the iCal URL. 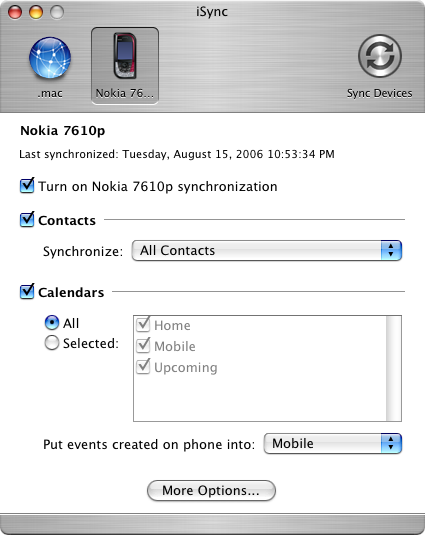 I then subscribed to that in Apple’s iCal, and set iSync to sync it with my Nokia 7610. 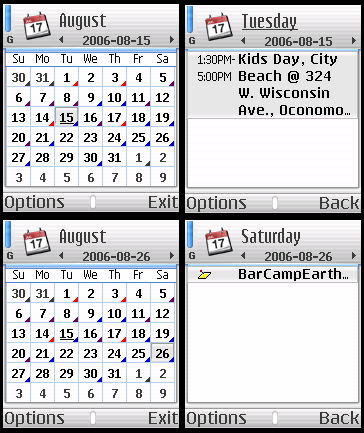 After syncing, my phone had all of ‘My Upcoming Events’ in the calendar. Posted on Tuesday, August 15th, 2006 at 11:30 pm. Subscribe to the comments feed. Both comments and pings are currently closed. Post on your own blog. This assumes you have a phone that actually works with iSync, but yes! I waited patiently for the day all the bits aligned and I could use iSync with my phone. I also fear the day the bits go out of alignment and I lose the ability to sync. Or the day when you can’t talk to anything useful in Series 60 Python….